Posted by GuySoft in Crictor, diy, Electronics, ipod, ITU, linux, open source, podcast, programming, python. After a few weeks of bouncing emails with Thomas Perl I am happy to announce that we have a working plugin for his wonderful podcast application called gPodder. With this plugin installed, any mp4 video podcast that is downloaded with gPodder is automatically converted to a format playable by rockbox MPEG player plugin. Effectively meaning seamless sync of video podcasts to any rockbox enabled device. I am specifically using the Sansa fuze player, but just changing the screen resolution at the top of the plugin should make it work with any other rockbox device, and with the right screen size. 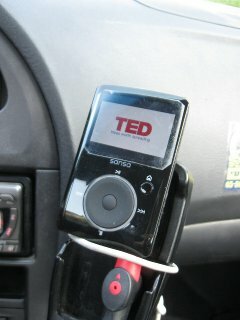 The final product for me of all this technical stuff is that I can listen to TED lectures in the car. Or using the verb was coined by my friend Uzair “TEDding” from my car. First you should have gPodder installed (available also as “apt-get install gpodder” or any other distribution install equivalent). make sure to include the .0 at the end. Thats it! Now each time video is download, for example from the TEDTalks Video Podcast it would be converted on arrival, and relinked as the file to be synced. As usual, I would love to hear feedback from users and suggestions. Posted by GuySoft in Crictor, Hamakor, linux, open source, podcast. After a long series of editing, the videos from August penguin are avilable to be watched and downloaded. Thanks to all the people that participated in this voluntary project. The files are available in a flash viewer, or to be downloaded in MP4 and OGG formats. Moreover, during the editing I have developed two tools for the Cinelerra video editor, those are also available for download. Posted by GuySoft in cinelerra, Crictor, Hamakor, open source. This weekend I am once again editing the video of the lectures we took at August Penguin, the Israeli open source community yearly meeting. This year it was kinda hard because there were two lectures being given simultaneous, so there are about 8 hours of video to edit. Like last time, I am editing the videos with Cinelerra, the open source video editor. Last year I also wrote a post in Hebrew while editing the video, and I was hoping to keep the tradition. Also, this year, I have a little code surprise :-). Posted by GuySoft in Hamakor, irish, music. This post isn’t related to software for a change. Its about Irish music. During the weekend, I was in Jacobs Ladder Winter festival. And I took my video camera with me. I really just chucked it somewhere, and placed a microphone in the middle of us, while we played in the main session, managed by Braha Avraham (the general session scheme is that someone starts a tune, and those who know it join in, its all spontaneous!). Also in some parts, Colum Sands, from Ireland joined in. Also Shay Tochner, a well known local musician joined in. I was surprised how much of it actually came out, so I am uploading it all here as a reference. Also, I recorded two songs that Colum Sands sang. I am linking them here too (With his permission). Lastly, I have all of these videos in high quality digital video files. I can make mp3s or better video out of any of them. If anyone wants to do something with them, contact me, I’d love to help. You can view them from bellow, or go in the youtube playlist i made for them. I have a good solo in Part 10.